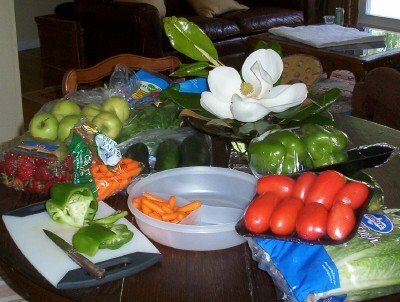 When I worked as a concierge at a fancy hotel, I loved going deep into the kitchens to pick up special trays of foods. Though I admired the delicate creations of the pastry floor, my favorite stop was always the garde manger--also called a cold kitchen, where fruits, vegetables, cheeses and the like were sculpted and arranged with artistic perfection. I try to remember the amazing colors and shapes when I process my own produce at home. Not that I'm carving radish roses or anything, but the idea that I'm readying foods that are both pleasant to the eye and good for the body. Right now, there are three things keeping my family eating our daily vegetables: Aldi, because I can grab the weekly basics at a consistently low price; yard sale Tupperware, because finding the right container means it's no harder to pop a platter of crudite in the pool bag than a bag of chips; and Sue Gregg's cookbooks, because her inventive suggestions have us eating side salads all week. I want a fridge full of perfect Tupperware too. You inspire me to seek out yard sales, and prep ahead, and to make some Sue Gregg ideas. Thanks! It's nice that you can prep all this ahead of time, isn't it? Except the berries, of course! You don't want to wash those until you're almost ready to use them. And I wish I had an Aldi's by me...I've heard great things about them. I've been so pleased with Aldi's selection of produce as well.Lately, I've gone wild for the grape tomatoes, bags of spinach and $1.49 pineapples! The produce departments in most discount grocery stores leave much to be desired! We used to have an Aldi's but don't live close any more! I wish we would get one here.